Main use: Used in freezer, refrigerator. Good quality and competitive price among the same area. Powerful production ability, quick delivery! 1. Compressor capacity should be determined according to each evaporating temperature mechanical load multiplied by the total system operating time factor. In addition to special requirements, generally do not use the machine equipment. 2. Selection, when the compression ratio is greater than 10 should be the two-stage compressor; Should be less than or equal to 10 single stage compression. Freon two-stage compression system generally should adopt a throttle in the middle of incomplete cooling. 3. Generally cold in some of the cooler, oil separators, condensers, liquid and other equipment should be with Freon refrigeration compressor cooling capacity to adapt. 4. Selection of Freon refrigeration compressors working conditions, working conditions shall not exceed the limit specified in Shenzhen cold storage companies. 5. Freon refrigeration cooling systems, heat recovery should be used in general circulation. 6. 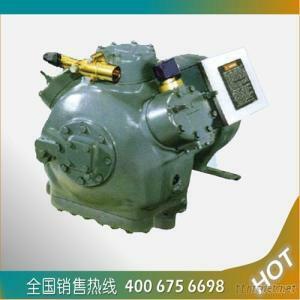 Refrigeration compressor operating hours, for 5 ~ 100t of cold, generally can be every day and night operation 12 ~ 16h.